Want more control over your Instagram ads? Have you considered using Power Editor? Using Facebook’s Power Editor can allow you to reach a refined Instagram audience. In this article, you’ll discover how to create Instagram ads easily using Power Editor. Discover how to easily create Instagram Ads using Facebook’s Power Editor. If you haven’t already done so, you’ll need to connect your Instagram account to your Facebook business page. If you have, you can skip ahead to the next section. 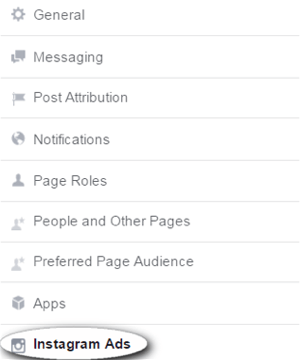 Visit your Facebook business page and click on the Settings button in the top right-hand corner. 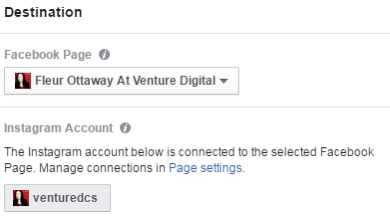 Settings button for Facebook business pages. Once inside the settings of your page, click on Instagram Ads, located in the left-hand menu. Linking your Instagram account to Facebook. From here, you’ll click the blue Add an Account button to connect your Instagram account. You have the choice to connect an existing Instagram account or create a new one. Fill out the requested information and click the blue Confirm button when you’re finished. Log into or create your Instagram account. Once your Instagram account is added, it should look similar to the screenshot below. Instagram account linked to Facebook business page. 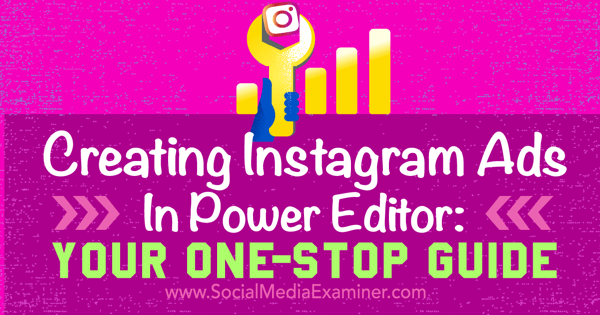 Completing this process means you’ll be able to access your Instagram account in Power Editor. 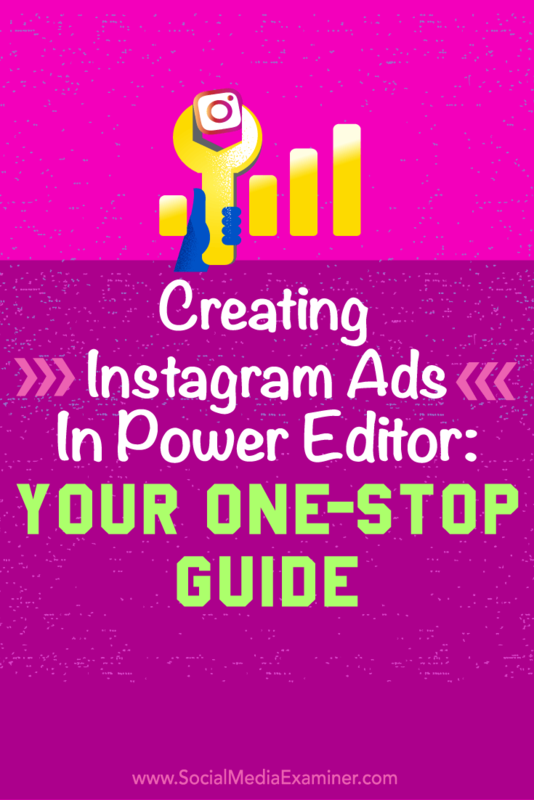 Next, we’ll discuss Instagram ad design tips and requirements before you begin setting up the ad in Power Editor. This next step shows you some best practices for your ad design and destination. Instagram has certain size requirements for photos and videos. 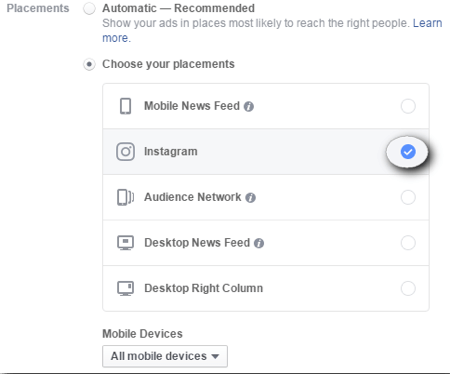 In addition, there are certain types of ads you may be familiar with for Facebook that aren’t currently available for Instagram. 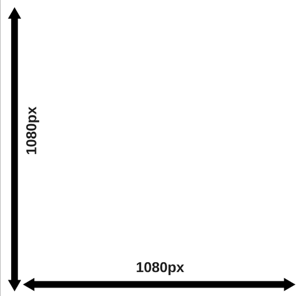 For picture ads, you’ll want to use an image size of 1080 x 1080 pixels (square). Use the same square aspect ratio for video ads (.mp4 or .mov) and a minimum 720p resolution. Video ads should be no more than 60 seconds long. It’s important to choose visually engaging, attractive media to entice users to interact with your ad. 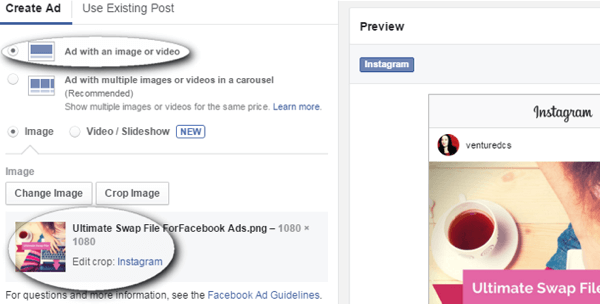 Note that Facebook’s advertising rules still apply: text on your photos should cover 20% or less of the photo, and don’t layer any buttons on your media. You can use Facebook’s grid tool to check the percentage of text in your photo. 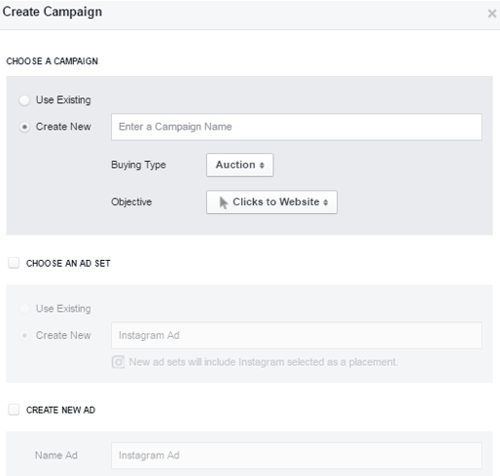 After you design your ad and choose your campaign objective, you can move on to setting up your ad in Facebook’s Power Editor. Here’s a walkthrough of how to set up and schedule your Instagram ad using Power Editor. 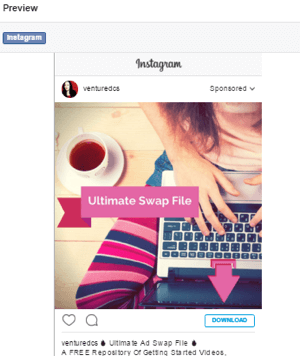 You can set up Instagram ads inside Ads Manager; however, Power Editor has fewer restrictions. 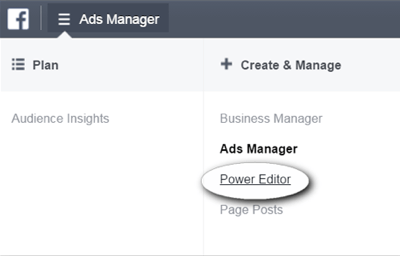 To open Power Editor, visit your Facebook Ads Manager and click on Power Editor in the top menu bar. 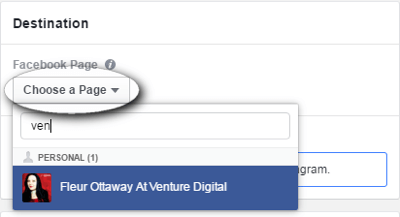 Alternatively, if you’re using Facebook’s Business Manager, you can click on the top left-hand menu labeled Ads Manager and select Power Editor from the drop-down menu. Power Editor for Business Manager users. Power Editor will open in a new window, which will look similar to the screenshot below. 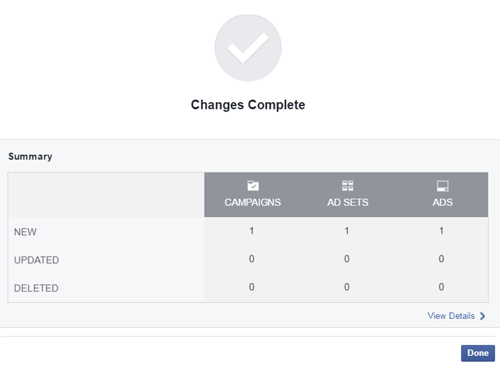 Three parts make up an ad in the Facebook ad platform: campaign, ad set, and ad. We’ll go through each section so you can recognize the location for future edits. To begin, click the Create Campaign button, located on the left of your screen under the Manage Ads heading. New ad campaign window in Power Editor. 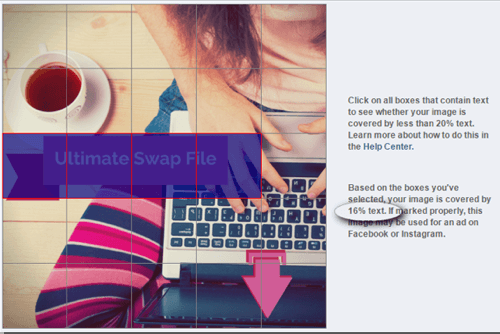 In the Campaign box, type in Instagram Ad and choose the objective Clicks to Website. Choose and label your campaign objective. 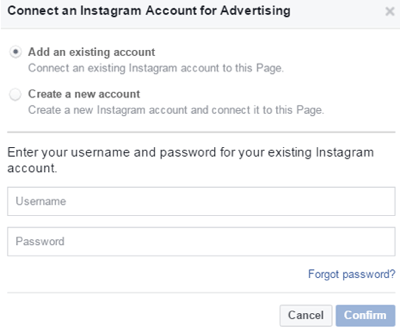 In the Ad Set box, click the checkbox to create a new ad set and also label it Instagram Ad. Note: You can change labels later if needed. 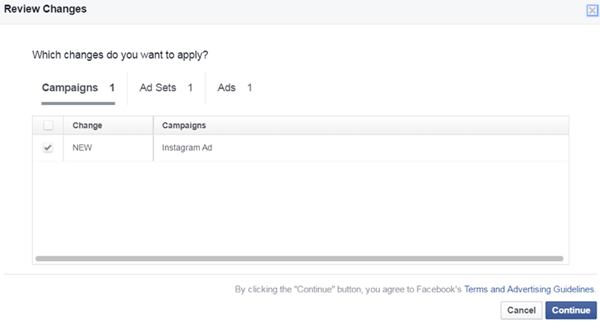 In the Ad box, click the checkbox to create a new ad and label it Instagram Ad. Click the blue Create button when finished. Label the ad and click Create. At this point, you’ll see the Campaign tab. There isn’t anything left to do on this tab, so click on the second tab down called Ad Sets. Ad Set tab location and view. Inside the ad set, you can edit the schedule, budget, and targets. Select Instagram Only for the ad placement. Then set your budget and schedule. Next, scroll down to set the audience targeting. 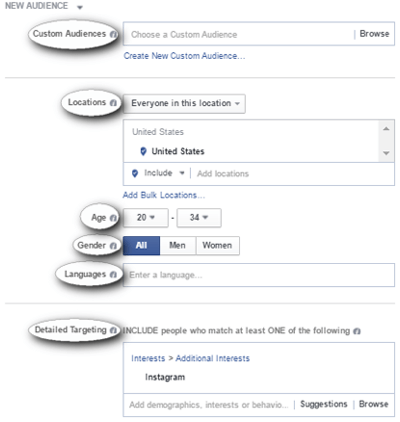 Set up your ad targeting options. Scroll further down the screen to find the section labeled Placement. It will be set to Automatic, like the screenshot below. Since you want to run this ad on Instagram only, select the radio button for Choose Your Placements. This allows you to edit where this ad displays. Turn off each placement. Leave the blue check mark for the Instagram placement only. You’ll now move into ad creation. Click the third tab in the far left-hand menu to open the Creating Ad tab. Open the Ad Creation tab. To begin, under the Destination section, choose the correct page from the drop-down menu. You should now see the Facebook page and associated Instagram account listed. If you don’t see the Instagram account, go back to Step 1 to ensure you added it to your page correctly. Ensure your Instagram account is connected. Scroll down to the Create Ad section to add the media. This example uses an ad with a single image. Select the radio button and upload the picture created previously. Choose the ad creative option and upload the file(s). Scroll down to fill out the remaining information for the ad. Include the website link, display URL, caption text, and the call-to-action button. Fill out the ad copy and details. You can see a preview of the ad to the far right. This is how the ad will display on Instagram. Notice the call-to-action button because it will be clickable in the Instagram news feed and will take people to the website link previously entered. Now that everything is filled out, activate the ad by uploading it to the Ads Manager. Click the green Review Changes button in the top right-hand corner. Click the Review Changes button. You’ll be asked to confirm your changes. If there are any problems with your ad, at this point you may see an error message letting you know what’s wrong. If no errors display, click the blue Continue button. Review changes and look for any error messages. A confirmation window appears once the changes have been uploaded. Click the blue Done button to close the window. The ad has now been uploaded. If you want to view any of the results of your ad during the campaign, you can use Ads Manager to monitor it. Your ad will now run inside Instagram. However, it’s important to note that you won’t see the post on your Instagram account because it’s a dark post. If anyone comments on the ad, you can reply to people through the Instagram mobile app. Instagram can be an effective platform to advertise on, especially for visual or mobile app promotions. To truly test the Instagram ad platform, create your Instagram ad campaign as a stand-alone campaign like we did in this guide and use it to shape your future Instagram ad strategies. What do you think? Have you already used Instagram ads? Let us know how your ad performed in the comments below! 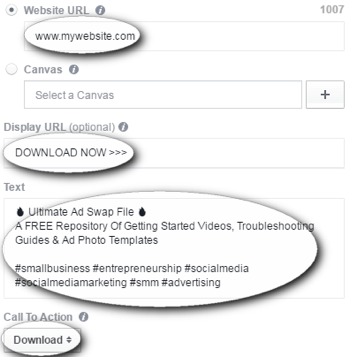 Tips on how to use Facebook’s Power Editor to create easy Instagram Ads. Fleur Ottaway is a technical marketer and trainer who loves teaching and consulting. Applying her background in IT and marketing, she helps businesses learn how to leverage technology for growth!